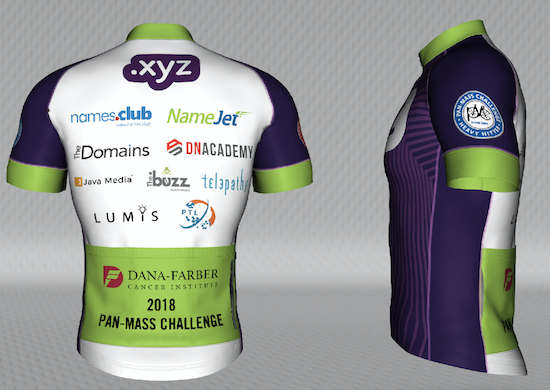 My 2018 Pan-Mass Challenge cycling jersey design is complete! With the strong commitment of 14 generous domain industry companies, the jersey sponsorships generated over $9,000 worth of donations that will directly benefit the Dana-Farber Cancer Institute in Boston. Our 2018 PMC fundraising currently stands at $10,700. My fundraising goal for the year is $12,000. If we get close to $15,000, we will pass the $50,000 mark in funds raised for Dana-Farber since I started riding in the Pan-Mass Challenge 4+ years ago. That’s my stretch goal. If you can help with a donation of any size, it will go to a great organization, and I will appreciate the support. Here’s a full list of friends and colleagues from the domain industry who have supported my ride generously this year. As I shared last week, I am going to raise $12,000 for Dana-Farber Cancer Institute by riding in the 2018 Pan-Mass Challenge. I reached out to domain industry friends and colleagues to sponsor a customize cycling jersey that I will wear on the second day of the 162 mile ride, and several domain industry companies made great contributions. 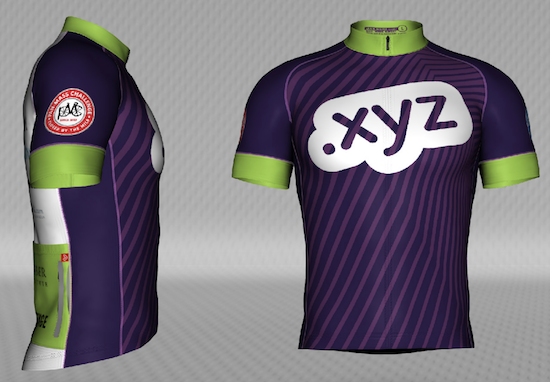 Daniel Negari of the .XYZ registry offered to be the lead sponsor of my cycling jersey and is making a large donation to my PMC ride. His graphic design team created the design for the jersey, which I am proud to unveil today. The design was converted into a 3-D rendering by Jakroo, the company that has made my jerseys for the past few years. Once all of the funds have been processed by the Pan-Mass Challenge, our fundraising effort will be close to $7,000! There is still room on the back of my jersey for 4 1 additional logo. If you would like to have your logo featured on the jersey, please let me know! I would be very happy to include your logo as a “thank you!” In addition, since the jersey is being created about a month earlier than last year, I should be able to wear the jersey for the longest training rides. All spots have been claimed and the jersey has raised just almost $9,000 for Dana-Farber Cancer Institute! I ride in the Pan-Mass Challenge for two reasons – to raise funds for Dana-Farber and to raise awareness of Dana-Farber. Your support in the form of a donation (of any amount) to my PMC ride would be meaningful to me. Thanks for your support! 2018 Pan-Mass Challenge Fundraiser – Thank You! I will be riding in the 2018 Pan-Mass Challenge to raise money for Dana-Farber Cancer Institute (DFCI) in Boston. DFCI is one of the leading cancer organizations in the world – both in terms of cancer treatment and cancer research. Last year’s Pan-Mass Challenge raised $51 million for Dana-Farber! For the third year in a row (and my fifth PMC ride), I will be riding the 2-day, 162 mile route from Wellesley, Massachusetts to Provincetown, Massachusetts. I set a fundraising goal of $12,000. Last year, with the help of friends and family, we raised over $11,000. In the first four years of riding in the Pan-Mass Challenge, we have raised over $35,000 for Dana-Farber Cancer Institute. I couldn’t do this without your support – Thank You! If you are able, I would greatly appreciate it if you could support my ride by donating to Dana-Farber via my PMC fundraiser. You can donate via my fundraising page on PMC.org. Listed below, are this year’s generous domain industry donors so far. I would love to add you to this list, regardless of how much you are able to contribute. I will keep a running tally of domain industry donors as a way to say thank you! Listed below, are this year’s generous domain industry donors (or commitments to donate) so far. I would love to add you to this list, regardless of how much you are able to contribute. I will keep a running tally of domain industry donors as a way to say thank you! If you are interested in donating at the $500+ level, get in touch so I can chat with you about sponsoring my jersey this year. There are 14 spots available (4 remain) so please connect with me first to confirm availability. All spots have been claimed. Here’s last year’s jersey for a reference point (although John is not riding with me this year). Update: Here is this year’s jersey design! My family and I just returned from a week-long vacation on the beach in Tamarindo, Costa Rica. Tamarindo is one of my favorite places to visit. The people are super-nice, there are plenty of food options, most locals speak English, and it is a relaxed town. 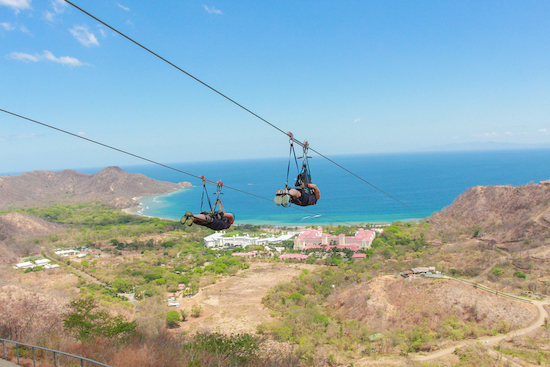 We love visiting Costa Rica, and especially the town of Tamarindo. After making our travel plans, I remembered that Monte Cahn mentioned something about spending time in Costa Rica. I reached out to Monte to ask if he would be in Costa Rica while we were down there. Unfortunately, Monte was in Florida, but he told me about a non-domain industry investment of his: Diamante Eco Adventure Park. He thought my family would love it, especially the kids. I looked at Diamante’s website, and I was sold after watching the video on the home page. In addition to zip lining, ATV riding, and horseback riding, there is an animal sanctuary and botanical garden. I instantly knew the animal sanctuary would be a big hit with my kids. There were all types of local animals – from monkeys and sloths to a puma and a jaguar. There is also a butterfly sanctuary. I told Monte we were in, and he told me he wanted to treat my family to a day at the Park. Last Tuesday, we took an hour-long van ride to Diamante. When we arrived, the people were expecting us and greeted us like we were longtime friends. I would say we received special treatment because of Monte, but the staff seemed friendly to all of their guests. On Tuesday at NamesCon, I will participate in the presentation of the annual Lonnie Borck Memorial Award during the ICA’s panel session. During the past year, many domain investors have reached out to ask what they can do to honor Lonnie’s memory and/or help the family. 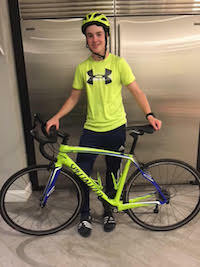 Lonnie’s 15 year old son Ezra is training for a 180 mile bike ride called Bike4Chai. Ezra is riding in memory of his Dad who wanted to do the ride with him. Bike4Chai raises funds for Camp Simcha, an overnight camp for children with serious illnesses. Ezra is hoping to raise $10,000 and I am sure it would be appreciated if Lonnie’s industry friends would support his ride.